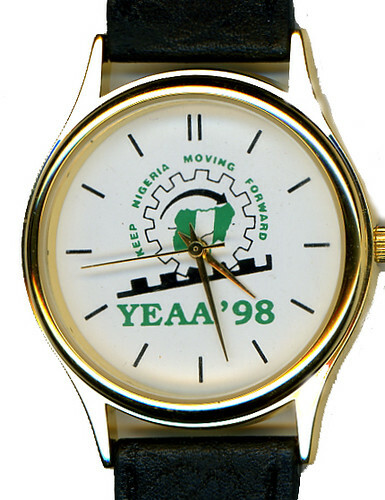 I present the following item from the Remembrance of Rogues Past collection: a campaign watch for the YEAA '98 campaign, namely the Youth Energetically Advocating Abacha shell organization that supposedly was spontaneously formed to campaign for that suffocating, murderous and dictatorial rogue, General Sani Abacha — late, unlamented and so forth. I'm a avid collector of this kind of historical artifact and you'll sometimes find me bidding for a mint copy of the Franco sings for Mobutu album, to take a recent example and different rogue (quite a good album actually). The Abacha watch, while in the mode of praise singers and sycophants, is not your standard piece of dictator chic, it's much more functional and thus perhaps more insidious. In any case, it's worth some brief notes. Back in the twilight zone of military rule in Nigeria circa 1998, it appeared that the dictator was feeling some pressure to make gestures towards democracy. The response was of course to think about how to hand over to himself, accordingly he devised lots of gestures. Having outlawed all organized opposition, the general decided to organize two approved political parties, "one a little to the left and the other a little to the right". Manifestos and constitutions were written, ostensible political philosophies were crafted and so forth, all by the military. The remaining question was who would lead these newfangled parties and there were any number of sycophants auditioning for the right to head these organic parties sometime in the future, if indeed elections would ever be held. This is where the Youth Energetically Advocating Abacha came in. The first order of business, as if this stage managing wasn't enough, was to start a whisper campaign urging both parties to nominate said dictator as their flagbearer. When more than whispers were needed, YEAA was to be the public face of the campaign, ready to whip naysayers into place. The idea was to coronate Abacha and win by acclamation the nomination from both of the parties a little to the left and right. A man of the people, he simply wanted to underlie that the youth wanted him to serve them and, moreover, that they were energetic — an obvious warning to anyone who might oppose the general. The thought was that he would face off with himself in new elections and succeed himself, or something of the sort - the main point was to hold elections. On the one hand these actions were crude and ridiculous, on the other, they are simply sad. Whenever I look at the watch I think to the whole contingent of lobbyist firms, replete with consultants, who came up with the strategy and the inspirational name (Yeah! ), the graphic designers called in to design the logo with the arrow and the wheel mechanism (perhaps fitting, for Nigeria under Abacha was on a road to nowhere), the coinage of the snappy slogan, the time spent uploading artwork and discussing typography with the design firm in California, the negotiations with Singapore factories for the production of watches and other insignia (for there were many containers worth of this stuff produced, T-shirts, key tags etc. ), the shipments to Nigeria, the distribution of this largess around the country... The watch is like an open wound in the Nigerian body politic, testimony to the workings of a global criminal enterprise. No one advocated for Abacha unless they were paid. Youth Energetically Advocating Abacha is a simple byword for coercion, cynicism and an illustration of the lengths to which people can go when in the grip of greed. The depressing thing is the sheer energy of this huhudious regime and the scale of the graft (billions of dollars were stolen for sure) — one wonders how many millions were spent on similar minor accoutrements. What a waste but perhaps such is the world of riches. From all accounts Nigeria is much changed these days and a few of the victims of the regime are even (belatedly) getting their day in court. Perhaps it's best to move on and call this ancient history, perhaps one's outrage should be curtailed; let's leave it for the historians. For the record, the battery never worked. Helon Habila in his second novel Measuring Time continues to make a claim for prominence in the roster of young lions in African literature. Instead of the claustrophobia of Waiting for an Angel (which I recently discussed) he stretches his shoulders and decides to take on entire decades of African history. His writes in a deceptively simple style and focuses on storytelling. There's no overt lyricism; he'd claim that he is simply channeling the many stories that come to him. Still his is an ambitious agenda and he covers a lot of territory, after all his subject is modernity in Africa and all that means. The options available to the two twins who tell the story of Measuring Time is a simple statement about Nigerian society. On the one hand, there is life as a mercenary soldier following warlords like Charles Taylor from Chad and Libya to the messy Liberian civil war. For a political junkie like me, this would be enough to focus on for an entire novel, for Habila this is merely interstitial. On the other hand, the bulk of the book and the other twin's story is about stagnation and making do at home. There is lots of striving but precious little light. Yet the stories of the past need to be told, the politics need be engaged in - however programmatic they may be, the youth need to be taught, we all need to fall in love. There's no time to dance or to succumb to navel gazing. Life has to be lived in full. In his populist writing mode Helon Habila is perhaps heir to Cyprian Ekwensi whose favourite subject was city life. Like Ekwensi he has a talent for empathy with his characters and draws you in with detailed portraits. He really knows how to capture moments in time. I am also reminded in this novel of another ambitious second novel that packed a lot of ideas albeit in a different genre, Colson Whitehead's John Henry Days. But perhaps we shouldn't tie a talent like Habila to others. He's writing delicate novels of ideas disguised as unvarnished, personal stories of Nigeria; the whole world is his. Wasted Time , my favourite song from her appropriately-titled album, Bitter, finds Me'Shell in a suitably bitter mood. She has an unerring way of capturing an atmosphere in song. Bitterness is a transient emotion but one that is intense when one is in its grip. It's the only vaguely uptempo song of the album, building up the groove slowly as she reflects on a break-up. It's not quite a lament and she hasn't yet resolved the episode. It is a raw meditation on wasted effort. Fittingly the song cuts off abruptly, unsettling the listener. Wasted time never to be recovered. Update: A good friend sends along a Cambodian twist for the collection: a Dictator Hun Sen "fashion" watch. He notes, "Never tried wearing it. Battery assumed dead".